When I taught at Ramapo, on the first day of class, I would ask my international finance students to help me build the balance sheet for the whole global economy as if it were co-owned by the entire human race — no estimated values of course, just the items listed in the statement. The typical makeup of class would be seniors or, at least, juniors who had already taken two heavy courses in financial accounting, one or two micro courses, one or two macro courses, two courses in corporate finance, perhaps one money and banking, and at least one econometrics. Some of them worked for banks or financial firms in northern NJ or Manhattan. The starting point was the balance sheet of a typical firm. (We’d treat governments, nonprofits, households, individuals as “firms.”) On the balance side, it’d have assets: cash and liquid securities, receivables and other short-term financial assets, longer-term financial assets, inventories, equipment, vehicles, buildings, and real estate. I asked them to, first, consolidate the balance sheets of all U.S. firms and then add them to the consolidated balance sheet of the rest of the world. At this point, they would start to see how all the financial claims issued by U.S. firms and held by other U.S. firms would be on both sides of the sheet and thus dropped out. At the end, they’d have on the top of the U.S. asset side only domestically-held foreign financial assets and the different forms of U.S. productive wealth. All U.S. cash held by Americans would cancel out, because it was a liability of the U.S. government offset by the cash holdings on the asset side of Americans. On the right hand side, they’d have the U.S.-issued financial assets held by the rest of the world, including the portion of U.S. currency not held domestically. In the rest-of-the-world balance sheet, they’d report those same U.S.-issued financial assets plus the productive wealth held by the rest of the world. On the liability side, the same things that appeared on the left hand side of the U.S. balance sheet. At this point, the students would start to come up with the punchlines. “What else is required?” Something that our accountant’s global balance sheet didn’t show, because slavery is illegal. Indeed, [hu]manpower. 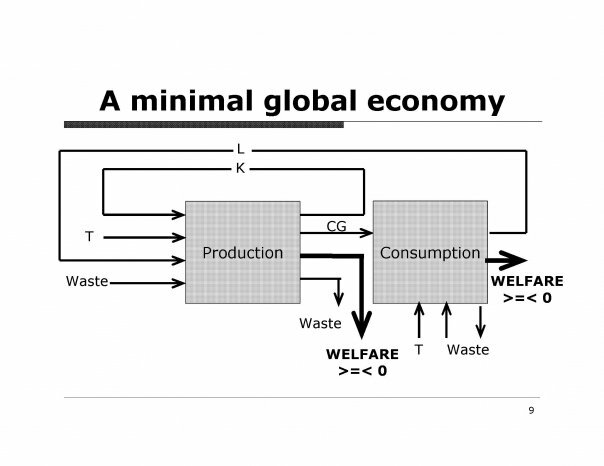 “What else is produced when people produce wealth?” Somebody would say “garbage.” Right! Garbage, pollution, waste, noise, etc. We produce goods and bads. Goods enhance welfare. Bads reduce it. An arrow out of production into nowhere would indicate those bads. “Aside from well-being, what else is produced when people consume?” “Garbage as well.” Another arrow out of the consumption box. And labor. People replenish themselves and produce themselves as producers when they consume. An arrow from consumption looping back into the production box. A last push: “Do garbage get into our consumption and production boxes? Is the bad side of nature feeding back into those boxes?” Yes, the answers would pour. We live in noisy cities, breath polluted air, our products have toxic chemicals, trash entertainment, hurricanes, etc. Wealth (and well-being) can only be produced the hard way, with productive wealth: labor, capital goods, natural resources. Central banks and regular banks can create money. And almost anybody can create financial assets. But that is not the same as creating actual wealth. Finance doesn’t produce wealth. It consumes wealth. Therefore it doesn’t produce well-being. “Not directly” — a student would reply — “but if financial markets transfer wealth to its best uses, then financial markets help preserve well-being.” The markets-are-efficient argument. The efficiency of financial markets can’t just be assumed. It has to be shown that they are indeed doing that job. But, in a reference to their micro courses, I’d ask: “Do markets (e.g. financial markets) always lead to an efficient allocation of resources, goods, and bads?” “No, there are market failures: monopoly, externalities, public goods, information imperfections.” Financial markets are plagued by them. At some point, I’d show them a chart with the estimated size of the different financial markets. By comparison, the figures dwarf global GDP. Are financial markets efficient? Why are they so bloated? Remember, they use wealth, but they don’t produce it directly. Are they really giving the human race the bang for the buck? Forex markets were the biggest: spot, forwards, futures, options, swaps, not only on currencies but also on deposits (interest rates), volatility, etc. — and lots of exotics. I’d ask, “Look at what happened in Europe. What do you think would happen to the forex markets if there were a single global currency?” No need for them. They’d disappear. And no need for a course in international finance. We could be in the Bahamas instead! Next And the Nobel goes to… Paul Krugman! Yes, foreign exchange trading eventually will be studied as history, just like vacuum tubes and slide rules. The challenge for the world is to make a smooth and safe transition to a Single Global Currency as soon as possible. The success of the euro has shown the world that monetary union is a solid foundation for monetary stability and the optimal monetary union will be a Global Monetary Union. The euro is likely to be the core of the Single Global Currency in such a monetary union, not because it’s superior to the U.S. dollar, but because it’s managed for many countries rather than for one country. The Single Global Currency Association promotes the implementation of a Single Global Currency, within a Global Monetary Union and managed by a Global Central bank, by the year 2024. With the successful use of the euro and other common currencies, more and more people and organizations and nations are seeing the advantages of monetary unions. Our website is at http://www.singleglobalcurrency.org. The Association recently published the 2008 Edition of my book, The Single Global Currency – Common Cents for the World. A copy of the 2007 edition is available at the Munchen personal archive at http://mpra.ub.uni-muenchen.de/5879/ and on the Association’s website. The goal of 2024 is only 16 years away. If one looks at the world before the 2002 distribution of the euro to the people of the EMU, you would have seen in 1986 a Europe with a Soviet Union, an East Germany and a Berlin Wall. At that time, most Europeans would have scoffed at the idea of a new monetary union. – Zero transaction costs to exchange currencies. Presently, $3.2 trillion is traded every trading day and all this trading and its associated costs, approximately $400 billion annually, can be eliminated. – The end of “Balance of Payments”, “Current Account” and “global imbalances” problems for currency areas. There will, of course, still be trade and wealth inequalities, and more visibly; but they will not be compounded by the problem of foreign exchange transactions and reserve requirements. There would be no need for countries to maintain international reserves of other currencies. – Zero risk of national and regional currency crises such as occurred in the 1990’s in Mexico, Argentina, Malaysia, South Korea and Russia. – Minimal inflation, assuming that the future global central bank sets and achieves a low inflation rate, just as the European Central Bank has done. It’s not clear that a zero inflation rate can be secured, as that would bring an economy perilously close to deflation and a deflation spiral, but certainly a low rate of inflation would be better for the world than the current rates. – Worldwide asset values will increase by about $36 trillion due to the elimination of currency risk. Such an increase in asset values will cause annual worldwide GDP to increase by about $9 trillion. – With no currency risk, worldwide interest rates would be lower. While all these benefits are expected upon the implementation of a Single Global Currency, considerable benefits will also come during the implementation processes which will see the reduction of national currencies as predicted and welcomed recently by Benn Steil in Foreign Affairs. Of course, not all economists agree with the goal of a single global currency. For those who would label the single global currency utopian, we call their attention to the euro, which began as a plan only about 30 years ago. Who would have thought in the 1970’s that Europe would not only adopt a common currency, but also that its member countries would discard their old currencies? The single global currency might be an enlarged transformation of one of the current major currencies (dollar, euro, yen), perhaps with a new name such as “dey”, “eartha”, “geo”,”globo” or “worldo” or it might be a new currency with such a name. How we get to that point is, of course, a major challenge, but there are several possible routes. One is to continue the trend of creating and expanding regional monetary unions, and then combine those monetary unions into one. Another is for smaller countries to continue to “ize” their nations’ legal tender, as in “dollarize” and “euroize”, as has been done in El Salvador and Monaco. Compatible with all these and other routes is the need to convene an international monetary conference of nations, monetary unions and related organizations, and begin planning for the implementation of a single global currency.